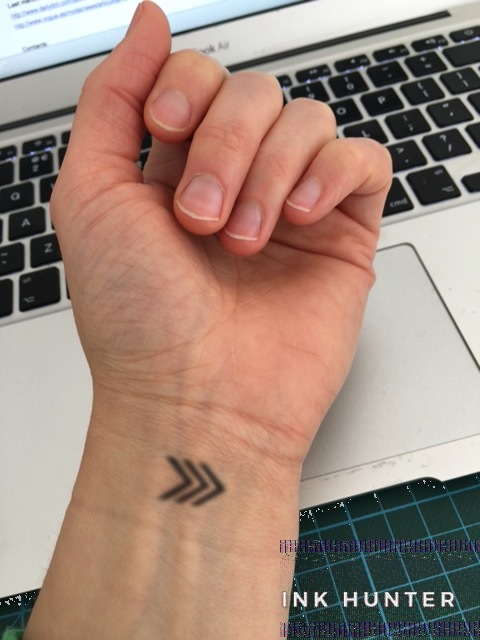 If you’ve been procrastinating about getting a tattoo here’s a neat little AR app, called InkHunter, that’s aiming to help you decide what and where to ink without having to regret that snarling wolf facial tat after the fact. The app includes a selection of designs by different tattoo artists that you can try out virtually via the automagic of smartphone-powered augmented reality placing pixels on your flesh in real-time. You can also upload your own sketches to the app to see whether your pen skills are sharp enough to merit leaving a permanent mark on your person. In a neat touch, the app asks you to put a little ink on your skin — think of that as part of the try before you buy process — because you need to draw a flat-lined emoji-style face (called Square Smile) on your person in the place where you’re considering the real deal. Built by a team of software engineers based in the Ukraine, InkHunter started life as an idea born out of a 48 hour hackathon back in July 2014. Two of the original team decided to continue with the project after that, rewriting, resdesigning and launched an MVP as an iOS app around two weeks ago — so, caveat, it is still a little rough round the edges. And doesn’t always position your potential tat quite where you’d want it to go. But hey, this is only digital ink so it doesn’t really matter if things go a little wonky. He says the team also intends to work on being able to overlay color tattoos. At present it only supports black and white. Other features in the pipeline include an adaptive custom sketch uploader, the ability to remove photos/sketches from the gallery (currently you can’t so — another caveat — any saved virtual tattoo try-ons are temporarily indelible… ), and navigation and search features for the tattoo gallery. The app is free to download and use, but nudges users to buy tattoo artists’ designs if they try one and save a snap of it. The plan for monetization is to take a cut on any sales, although the future focus is likely to be more on bookings of specific tattoo artists, according Razumovskyi, rather than selling designs as he says artists generally prefer to ink their own designs. “We are involving tattoo artists to connect them with our users. In doing so, our app will become a funnel which starts with people who are just thinking about tattoo and ends with those, who are confident in the tattoo they want and artists who can get it done,” he says, noting they are currently working with six tattoo artists. “We just start develop our business model. Today we foresee it to be a 5-10% of booking deposit for tattoo artists, and fixed CPC for temporary tattoo services. But we have a few perspective ideas we going to test nearest few month,” he adds. Given the hipster popularity of getting inked these days InkHunter’s app should be well positioned to find a following — assuming it can get more tattoo artists signed up to beef up the number of designs available for virtual try-on. Razumovskyi says early users have been asking for more tattoo designs and styles, and says the plan is to have 50 tattoo artists on board by the next release, along with a new way to browse among the gallery.